1) You don’t have to sleep in a tent. Most campgrounds also offer some kind of static caravan (like a mini mobile home) or bungalow that you can rent. 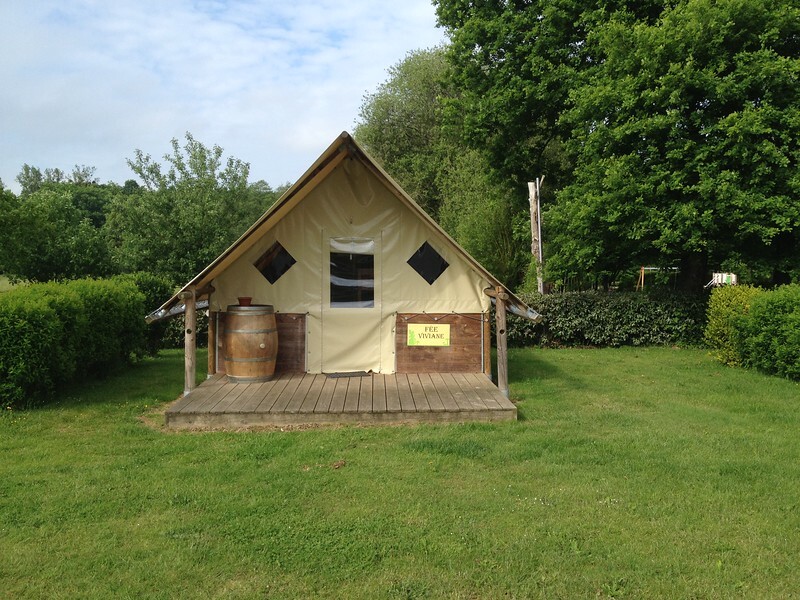 Some offer “glamping” options such as yurts, tipis, treehouses, safari tents, or gypsy wagons. Glamping tent in Brittany, France. 2) It’s not just about saving money. Yes, sometimes camping can be the least expensive way to see Europe but there are also luxury campgrounds where the draw is the amenities such as swimming pools with waterslides and spa facilities. On a road trip through Europe? Sometimes campsite bungalows are a better option than a hotel because they offer free parking. One night in Brittany, a group of 8 Lotus sports cars pulled up in front of the bungalows across from our tent. They left the next day so I can only assume that the campsite was the best place to park 8 cars as the hotels in town offered very limited street parking. 3) You are not stuck out in the middle of nowhere. Many campsites are located within walking distance of a town or city, sometimes campsites are even in the middle of a city. Sometimes, they will be located next to a bus stop or other public transportation so that you can get into the city. 4) Motorhomes can find free places to stay in France. Several countries including France, Spain, and Portugal have designated, free overnight parking places for motorhomes. Caravans are not allowed but campervans can sometimes get away with it as long as they are “self-contained”, meaning they have their own toilet. These sites are meant only for an overnight rest stop, not for camping but are very useful when you only need to stop for a rest on a long trip. To find out more, get a copy of the book All The Aires. Motorhomes can find even more free overnight stops at farms and vineyards with the France Passion Guide. Warning, your free stay may wind up costing you a bit if you find a vineyard with wine you like. 5) You need a hammer. There are times when you are camping on stony, hard ground that a hammer works better than a rubber mallet. We have had this happen in Spain and Croatia. A small hammer tucked in your tent bag can save a lot of effort. And speaking of tent stakes, those thin stakes that came with your tent are really only for securing the guy lines on your tent. You need to buy thicker, straight tent stakes for securing the corners of your tent. Don’t forget to buy a stake puller. 6) The plastic tops off your new, sturdy tent stakes will break off the first time you try to get them out of hard ground. To loosen a stake so that you can pull it out, gently hit the stake from side to side with a rubber mallet until it loosens. 7) You might need to buy that extra tent floor. There is great debate about whether tent floors are really necessary or just a way for tent manufacturers to make more money. If you are camping for short periods on grass or dirt, you probably don’t need one. If you are camping for long periods on gravel pitches, they really help protect the bottom of your tent. 8) Bring your own loo roll. We’ve only been to two campsites that didn’t provide basics such as loo roll and hand soap but it is best to be prepared. 9) There is wifi. All the campsites we have stayed at in Europe have at least had wifi around the reception area or bar. Some also have coverage over 70% of the campground. Some campsites will charge for wifi or charge for using more than one device but the prices we have seen have been reasonable. Speed varies greatly. In a big chain campsite in France, I was able to quickly upload 4 GBs of photos quickly while sitting in our tent with their paid wifi connection. In other campgrounds, the wifi has slowed to a crawl in the evenings when everyone is trying to stream Netflix. Overall, we have found better wifi in campgrounds than we usually get in budget hotels. This was surprising to us. 10) Ice is a precious item. Ice has been impossible to find in some areas of France. Campsites don’t sell it and neither did the supermarkets or service stations. Either everyone in France likes their drinks warm or they all own those little coolers that plug into your car’s cigarette lighter. If you are desperate to cool down a few drinks, buy a couple of packages of frozen vegetables for a temporary solution. 11) Ice (hielo) is available in most supermarkets in Spain. I love Spain. 12) Your kettle will not work on a 6 amp electricity connection. It will trip the circuit and make you have to find the campsite owner to reset it for you. A small kettle will work on a 8 or 10 amp connection or you can but a 12v kettle that plugs into your car’s cigarette lighter. 13) Camping is more family-friendly than most hotels. There is usually a playground and swimming pool, sometimes a toddler’s pool as well. Sometimes there is a game room. During high season (July and August), large campgrounds may have organised activities for children 5 and over. For picky eaters, campsite restaurants usually offer child favourites such as pizza, nuggets, or chips (french fries). 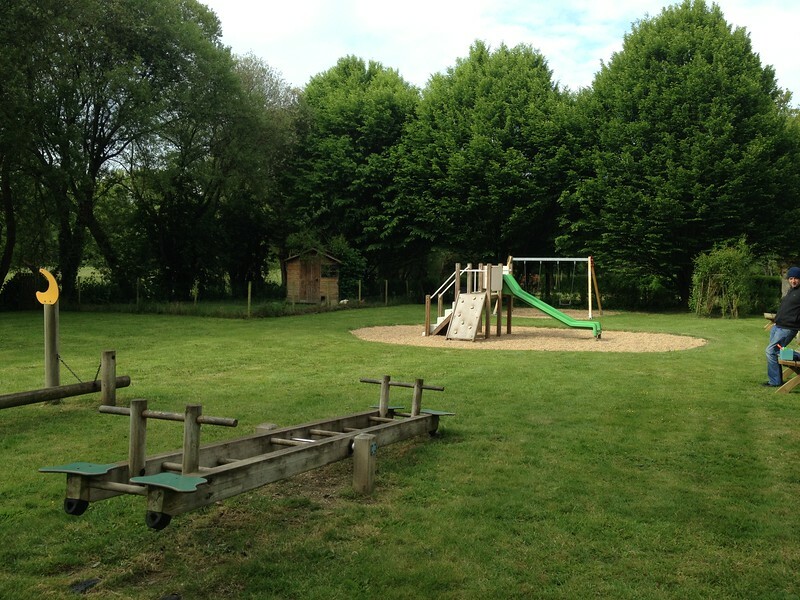 Playground at La Vallee du Ninian in Taupont, France. 14) There may be chickens, or a goat. Yes, really. 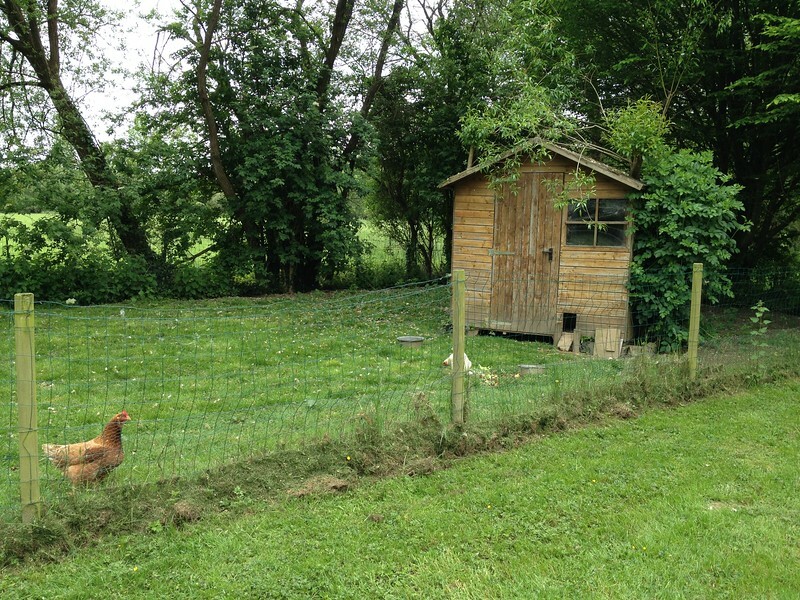 Small family owned campsites in France often had a mini farm with goats, chickens, or ponies. Sometimes they offer pony rides. Several campsites in Spain have had chickens with fresh eggs for sale. Chickens at a campsite in France. 15) Arachnophobes need not worry, there are fewer spiders and creepy crawlies than you might expect. Keep your tent zipped and you will rarely see a spider. In France, all but one of the spiders have been tiny things that can be brushed away without fear and we rarely saw them. The one spider that I forced my husband to deal with was found on the outside of the tent as we were packing it away and it was not even one that was dangerous to humans. Give the tent a good shake before rolling it up. I worried about Southern Spain but actually ran into zero spiders. Micheal saw a scorpion in Granada but it was small and I didn’t see any. Keep your shoes inside the tent or make sure to shake them out in the morning. You might be interested in the following books that are available at Amazon. Nomad Tales is a participant in the Amazon Services LLC Associates Program, an affiliate advertising program designed to provide a means for us to earn fees by linking to Amazon.com and affiliated sites. When we camped in Europe during the 60s and 70s there were no camp fires allowed. And the camp ground were not equipped with picnic tables. Has that changed ? The majority of campsites I have seen in Europe do not allow campfires. Campsites in areas with a high risk of forest fire do not allow individual charcoal grills but sometimes have a separate area with communal grills built out of brick. One of the nice things about camping in the Czech Republic is that small charcoal grills are often allowed and many campsites have a communal fire pit so you can enjoy a campfire away from the tents. But you are correct, I have never been to a campground in Europe that allowed campfires in the tent pitch area like I remember from camping in the United States. Picnic tables don’t seem to be very common. Most people bring their own folding table and chairs. Some campsites will have a small kitchen area with limited seating, mainly to cater to cyclist campers, I think. After camping a couple of summers through 17 European countries, I’ll vouch for all that’s stated above. Probably the greatest Joy’s come from meeting with your fellow campers from various countries. Keep a good daily log. You will refer to it for years. Maps and GPS are both essential. Keep everything small and light. Aside from an emergency ration of say, a bit of hard sausage, cheese, and a few crackers, enjoy a bit of marketing in each day. What local wine can you find for a euro? What can you glean from label pictures, when you can’ read the text? What veg do locals buy in the little open morning markets? This has got me to thinking about our next trip! I am an American doing research on camping in Europe and the one thing I am having trouble finding is, what do you do about camping gear? If I was in the UK–no problem–you are right there. Do I buy gear when I arrive? Are these places to rent gear? What if I don’t want to carry gear with me all over–will I absolutely need to rent a car? Your advice has been priceless so far– could you offer advice on what to do about the camping gear? Thanks!